Oatmeal Banana Waffles | eat. drink. be merie. Such wise words to live by. Sometimes you just need to take a break from work, school (thank goodness midterms are done! ), and the crazy schedules that we all have, and put waffles first. During the week I usually am awake pretty early, try to squeeze in a run if I have had enough sleep (a few months ago I would have thought this was a crazy idea, but Elle has been sleeping through the night much better lately), and folllow up with a bowl of oatmeal. This is pretty standard. There are soooooooo many different oatmeal concoctions that I can’t wait to try. I think next I will try carrot cake oatmeal. Because cake. For breakfast. Yes. Anyway, this weekend, I needed waffles. I just did. So I thought, why not combine my love of oatmeal and waffles? 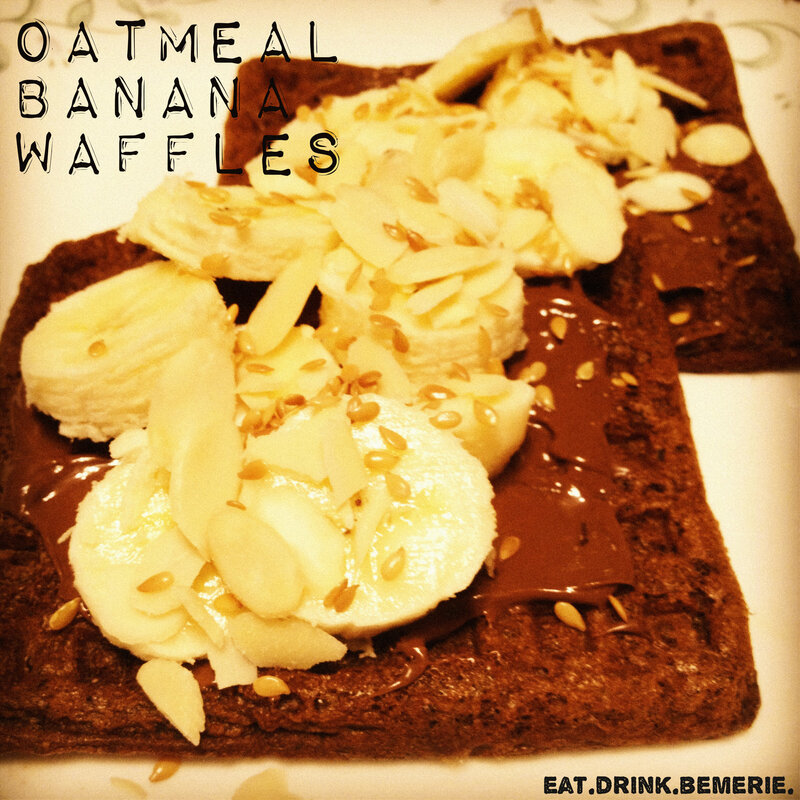 The result: healthy and delicious oatmeal banana waffles! Just put all ingredients into a blender (I used a magic bullet) and blend, baby, blend! When you’ve achieved a nice smooth mixture, your waffle batter is ready. Just use the same amount of batter in a waffle iron as you would for normal waffles. The only thing I would do differently is cook them about 1-2 minutes longer than normal waffles because of their kind of “gooey” consistency. I’d say they taste like banana bread in waffle formation…does it get better than that?!? While the waffles were still hot, I spread a bit of Nutella on them, added some sliced bananas, sliced almonds, and a sprinkling of flax seeds. Perfection. There is so much you could do with these. Peanut butter or almond butter on top would be amazing! Or…have you ever mixed vanilla Greek yougurt with honey and cinnamon? Get some pecans mixed in there, too, and BAM! Of course, you can always go with classic maple syrup. I like to cut back on the sugar, though, and use E.D. Smith’s No Sugar Added Syrup made from grape juice. Once you go Smith, you’ll always eat breakfast with! (Yes, I made that up.) Scrumptious combinations are endless. You can even make an extra batch and freeze them for later.